“Folk music is the product of a musical tradition that has been evolved through the process of oral transmission. The factors that shape the tradition are: (i) continuity which links the present with the past; (ii) variation which springs from the creative impulse of the individual or the group; and (iii) selection by the community, which determines the form or forms in which the music survives. Many people today would question some if not all aspects of this definition or even whether it is possible or desirable to define folk music at all. But that doesn’t stop us from recognising the folk genre or describing it. The surviving corpus of English traditional folk song dates essentially from the seventeenth, eighteenth and nineteenth centuries, but as folk song was never standardised but subject to continuous variation, in some sense a song is only as old as the last time it was sung. Traditional folk song declined in the second half of the nineteenth century, with the growth of urbanisation and mass entertainment. But at the turn of the nineteenth and twentieth centuries, thousands of remaining songs were gathered by collectors and preserved for posterity. Those collectors exerted great influence on the whole concept of folk music, including a strong emphasis on oral transmission, although the importance of the circulation of songs on commercially-printed ‘broadsides’ is now generally accepted. Indeed, collectors were often forced to ‘complete’ fragmentary oral versions from broadside publications. Traditional folk songs range from narrative ballads, through lyrical songs to work songs – most notably sea shanties which were designed to synchronise the muscular effort of turning a capstan, hauling on ropes or working a pump. Folk songs embrace many themes including love, war, the agricultural year, and seafaring as well as the dramas of poaching, highway robbery and transportation. They range in style from the poignant to the rumbustious. Although typically associated with rural life and the age of sail, there are also industrial folk songs about mining and factory life. 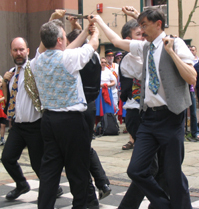 Side-by-side with the songs, there is also a tradition of English social dance music which in some country areas (such as on Dartmoor) survived in an unbroken and unselfconscious tradition to the present day. Ironically, English people are probably more familiar with its Irish equivalent. Another aspect of the folk tradition concerns ritual and ceremony. Rooted in the seasons and the agricultural year, folk ritual often combines elements of music, song, dance, theatre and procession. 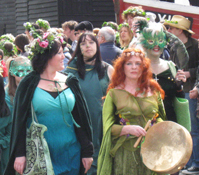 The most well-known examples include Morris and sword dancing, animal disguise customs, May customs and carols. A part of the strange beauty of English folk songs lies in the significant number of tunes which are ‘modal’ and which differ from the modern Major and Minor with which we are now most familiar. The most important of these are the Dorian with a flattened third and seventh but a natural sixth, and the Mixolydian with a flattened seventh. You can hear these modes by playing a scale on the white notes of a piano, the Dorian beginning at D and the Mixolydian at G. The Ionian Mode, beginning at C, gave us the modern Major, and the Aeolian, beginning at A, the modern melodic Minor with a flattened third, sixth and seventh. Quite a few tunes have a flattened third and seventh but lack a sixth altogether. These can be played starting at D or A. Traditional folk song in Britain enjoyed a revival in the 1950s and 1960s led by people like Ewan MacColl and Bert Lloyd who championed a return to traditional song in vernacular accents and they were followed by other revival singers such as Louis Killen, Peter Bellamy, the Watersons, Martin Carthy, Shirley Collins and Ann Briggs. Particular emphasis was placed on the repertoire and style of source singers such as Harry Cox and Walter Pardon and of living traditions such as the Copper family of Rottingdean, Sussex, a national treasure who have passed traditional music down through the generations and continue to do so. In the 1960s, and inspired by American singer-songwriters like Bob Dylan, the folk scene also took on board modern guitar-based acoustic music which became known as ‘Contemporary Folk’. Participation, which most would consider to be an inherent aspect of folk music was facilitated in modern form by the folk club or session. Clubs vary but are typically held in pub back rooms and generally feature a mixture of singarounds and guest nights. Sessions are simply gatherings to play tunes or sing, usually in a public bar, and tend to be even more informal. Modern folk clubs usually offer a mixture of Traditional and Contemporary Folk. The former is often sung unaccompanied, while the latter is typically based on the work of modern guitar-playing singer-songwriters. In comparison with other folk clubs, Tonbridge Folk Club (Nellie’s) is strongly rooted in Traditional Folk, but welcomes exponents of Contemporary Folk to leaven the mix. Situated in West Kent in South-East England, the club typically reflects English sources and especially those songs with local (Kent and Sussex) connections.